Dr. Lacey Samuels is an Assistant Professor in the UBC Department of Botany. Her research initiatives mainly focus on plant cell biology and the secretion of the cell wall. So some look like secretions (G) and some look like diffrientiated cells that are part of the secretions (not labeled but looking like glands with dents in them). So I am curious if the lipids are excreted through the labeled part (G) or if that is a drop of the essential oil and the glands are another part? Just wondering but not really sure I’ll get some answer! Great photo! Wonderful website. Thanks for sharing your botanical treasure chest with us each day. Mint tea is my favorite drink. Know I can visualize where the wonderful aroma and taste comes from. Plants are amazing. So is the micro imaging. Wonderful site, Always makes my day with a touch of plant life. Hi Adriana. Good eye picking out the unusual looking glands! The things that look a bit like glands, but have dents in them (sort of like a basketball) are glands that are still in the process of filling with essential oil. The glands are made of eight cells each. All eight cells secrete their oils into a common “pool” on top of the cells. The whole thing is surrounded by the cuticle, which holds the eight-celled gland and the essential oil together. Thanks to everyone else for your comments! i just love electron micrographs. Thanks for putting these series together, very interesting work! That is sooo amazing! The tiniest of things are often quite complex and gorgeous! Yes, those are stomata. This picture is of the abaxial side (the underside) of the leaf, where there are many stomata. 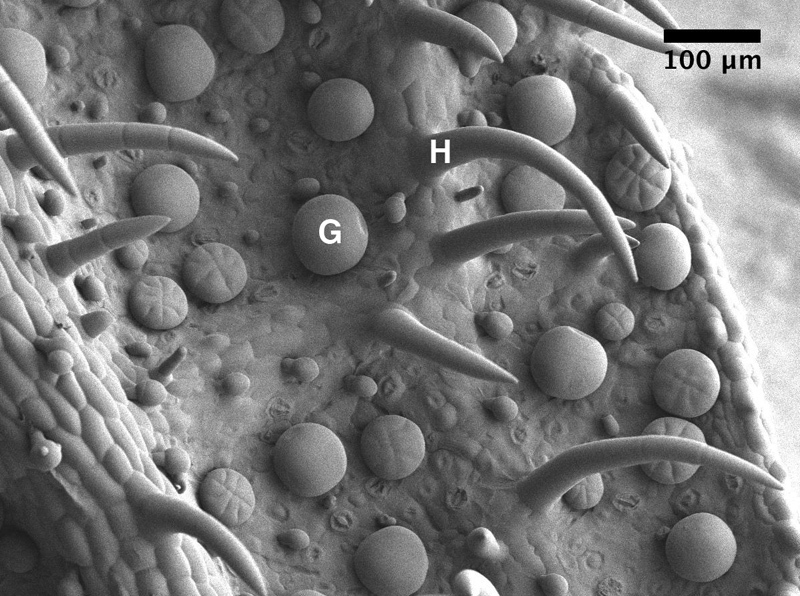 However, the adaxial surface (the top of the leaf) also has many glandular trichomes. And, yes, the non-glandualr trichome hairs are multicellular, unlike the Arabidopsis trichomes that were posted yesterday, which are single-celled and branched. What are these structeres, not labelled, smaller than the glands and the hairs. They look like small mushrooms or ice cream. They have a head. What is it? Please help me!